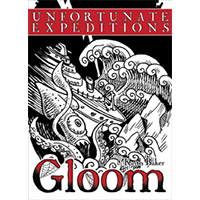 Unfortunate Expeditions introduces expeditions into the game. Only one expedition can be in play at a time. An expedition's rules affect all players as long as it remains in play. When you play a modifier of untimely death that has an expedition symbol, resolved the immediate effects of the card, then replace the current expedition with the one shown on the card. Some cards also have special effects that occur if an active expedition is already in play when the card is played.